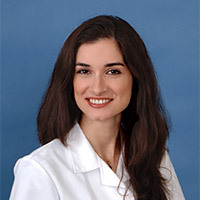 Dr. Evangelia Kirimis is a hematologist and medical oncologist who practices in Pasadena. While she has an emphasis on breast and gynecologic cancers, she treats patients with all types of cancer and hematologic conditions, and enrolls patients in UCLA Health’s full scope of clinical trials. She is board certified in hematology and medical oncology. When it comes to patient care, Dr. Kirimis prides herself on treating everyone as an individual, and considering each person’s work and family situation when making treatment recommendations. When necessary, she brings together a multidisciplinary team that includes ancillary services, such as nutrition counseling and psychology, as well as alternative treatment modalities. Her goal is to always find the right treatment plan for each patient that considers these factors and options. Dr. Kirimis received medical degree from the University of Southern California Keck School of Medicine. She then completed internal medicine residency and her hematology/oncology fellowship at UCLA. Dr. Kirimis was born and raised in Pasadena, and is happy to serve her home community. When she’s not working, she likes to stay active and exercise, and live the type of health lifestyle she advocates to her patients.